Before the Pro line, the iPad line-up was all about the 7.9-inch Mini and the 9.7-inch Air. It was the perfect tablet which managed to create a striking balance between a compact tablet and something on the productive side. Its air-thin design makes it an easy carry, making it feel like you’re holding a softcover book. The iPad Air 2 maintains a perfect balance of size and weight, making it a complete package. The first best thing that catches the eye is its thickness, which is obviously the key feature of the Air. It weighs just 437 grams, and adding to its beauty is its streamlined design, which surely puts the tablet in the premium category. 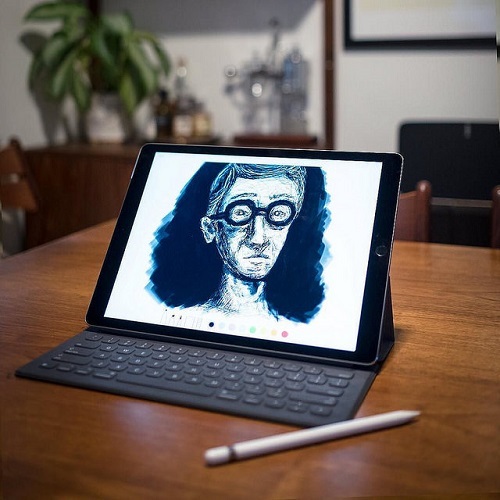 Just when we thought things couldn’t get any better, the company announced the next Apple iPad Pro 10.5, along with the new and improved iPad Pro 12.9. The company has made quite some improvements over the years in its iPad line-up in terms of design, if you compare the new iPad Pro models with the original iPad Pro 9.7. Besides the weight factor, the new iPad Pro looks almost identical to its predecessor – the 9.7-inch models look all the same – however, the new iPad lacks the True Tone display and anti-reflective coating. The company also reduced the bezels by 40 percent in the iPad Pro 10.5, while the bezels almost disappear in the iPad Pro 12.9. Technically, the new iPad Pro line is the company’s biggest update since the launch of the iPad Pro 9.7, especially the 12.9 version, which is a monster in every way. The world witnessed a new breed of the iPad which is bigger and faster in every aspect. Vivid display, better storage options, superb cameras, and faster processor – all in a compact package. The iPad Pro comes in two screen size options: 10.5-inch and 12.9-inch. The second generation of iPad Air, on the other hand, is available in 9.7-inch screen size. The 12.9-inch iPad Pro boasts a screen resolution of 2732×2048 px at 264 ppi, while the 10.5-inch model boasts a screen resolution of 2224×1668 px at 264 ppi. The iPad Air 2, on the other hand, boasts a 2048×1536 px display resolution (264 ppi). The iPad Pro – the 10.5 and 12.9 – is available in three internal storage options: 64, 256, and 512 GB. The new and bigger 512GB configuration makes it the first iOS device to offer that kind of storage option. The iPad Air comes in 16, 64, and 128 GB internal storage options. Inside the hood, the iPad Pro packs the advanced A10X Fusion Forth-Generation chip with 64-bit desktop-class architecture and embedded with Apple M10 co-processor, which makes the iPad Pro insanely faster and efficient than its predecessors. The iPad Air, on the other hand, packs the Apple A8X chip with 64-bit architecture and Apple M8 motion co-processor. Both the variants – the 10.5 and 12.9 inch – come built-in with 4GB LPDDR4 RAM which means better performance as compared to the iPad Air which packs only 2GB LPDDR3 RAM. The extra RAM means it will technically wipe the floor for the Air when it comes to multi-tasking. Coming to camera, the iPad Pro comes with a 12-megapixel primary camera which is capable of recording 4K videos and a 7-megapixel front-facing camera which can record up to 1080p high-quality videos. The iPad Air 2, on the other hand, has an 8-megapixel rear-facing iSight camera and 1.2-megapixel front-facing camera which is capable of recording 720p HD videos. A 2.39 GHz hexa-core 64-bit processor powers up the iPad Pro, while the iPad Air packs a 1.5 GHz tri-core 64-bit processor. The 10.5-inch iPad Pro (Wi-Fi model) weighs 469 grams (1.03 pounds) and the iPad Pro (Wi-Fi + Cellular model) weighs 477 grams (1.05 pounds). The 12.9-inch iPad Pro (Wi-Fi) weighs 677 grams (1.49 pounds) and the iPad Pro (Wi-Fi + Cellular) weighs 692 grams (1.53 pounds). The iPad Air 2 (Wi-Fi) weighs 437 grams (0.96 pounds) and the iPad Air 2 (Wi-Fi + Cellular) weighs 444 grams (0.98 pounds). The iPad Pro comes built-in with iOS 10 which can be upgraded to the company’s latest and advanced OS, the iOS 11. The iPad Air 2, on the other hand, comes built-in with Apple’s iOS 8.1. The iPad Pro is powered by a 12-core PowerVR series 7XT graphics processor, while the iPad Air 2 is powered by an 8-core PowerVR GXA6850 graphics processor. Available in 10.5-inch and 12.9-inch screen sizes. Available in 9.7-inch model. Powered by A10X Fusion chip with 64-bit desktop-class architecture and embedded with Apple M10 co-processor. Powered by Apple A8X chip with 64-bit architecture and embedded with Apple M8 motion co-processor. Comes built-in with a 12-core PowerVR series 7XT GPU. Comes built-in with an octa-core PowerVR GXA6850 GPU. Packs 4GB LPDDR4 RAM under its hood. Comes in 2 GB LPDDR3 RAM. 12-megapixel rear-facing camera with optical image stabilization and six-element lens. 8-megapixel rear-facing 1080p HD camera. 7-megapixel front-facing FaceTime HD camera with 1080p HD video recording. 1.2-megapixel front-facing camera with 720p HD video recording. Comes equipped with iOS 10 (upgradable to iOS 11). Comes with iOS 8.1. The biggest differences between the iPad Pro and iPad Air, apart from the display, are in the CPU and memory department. Apple has managed to double the memory size from the 2GB of RAM found in its predecessor, the iPad Air 2, to 4GB found in its latest iPad line. The whopping 4GB of LPDDR4 RAM combined with the company’s latest and advanced A10X Fusion chip makes the new iPad Pro stand apart. The iPad Pro is surely the way to go, if you don’t mind spending a whopping $600 or more on a tablet. Well, for those who don’t want to spend too much money and still want to go for a solid iPad without the bells and whistles, the iPad Air 2 can be a good investment and you won’t be disappointed. Sagar Khillar. "Difference Between iPad Air and iPad Pro." DifferenceBetween.net. October 24, 2017 < http://www.differencebetween.net/object/gadgets-object/difference-between-ipad-air-and-ipad-pro/ >.